What part of the world do foxes live in? 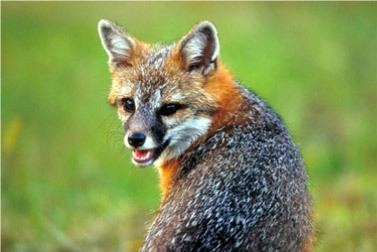 Gray foxes occur throughout most of North America from southern Canada to northern Venezuela and Colombia. They do not occur in portions of the mountainous northwestern United States, the Great Plains and eastern Central America. What type of habitat do gray foxes prefer? Gray foxes can be found in a wide variety of habitats but ideal habitat may include wooded and brushy country, often in rocky or broken terrain, and are possibly most common in the arid regions of the southwestern United States and Mexico. The preferred habit in Louisiana is mixed pine-oak woodland bordering pastures and fields with patches of weeds. What do gray foxes like to eat? Gray foxes are solitary hunters that eat an omnivorous diet. The most important food source for gray foxes is probably cottontails, but voles, rodents, shrews, and birds are readily captured and eaten. Gray foxes consume plant material as well and eat whatever fruits are available. Generally speaking, gray foxes eat more plant matter than other species of fox. How big are gray foxes? Gray foxes usually weigh between 8 and 15 pounds and measure about 31 to 44 inches long. Males are usually slightly larger than females. Do gray foxes have any predators? 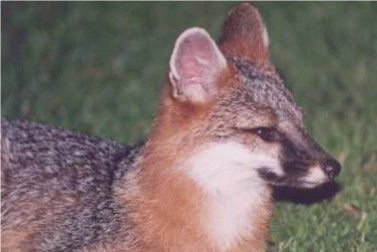 Large carnivores such as cougars, lynx, bobcats, and coyotes may prey on gray foxes. 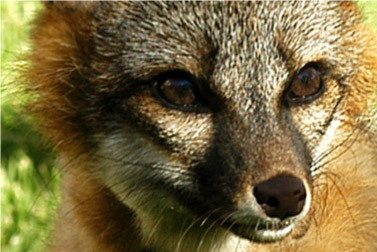 What types of behaviors do gray foxes exhibit? Gray foxes are unique among canids in their ability to climb trees and are sometimes referred to as tree foxes. They have strong, hooked claws that allow them to scramble up trees to avoid predators or to get fruit. They descend primarily by jumping from branch to branch. Gray foxes are nocturnal or crepuscular and den during the day in hollow trees, stumps or old woodchuck burrows. Radio tracking data suggest that family groups maintain separate home ranges. What types of communication and perception do gray foxes use? 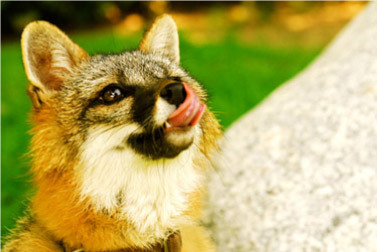 Like all canids, gray foxes have excellent senses of sight and smell. As with other canids, gray foxes most likely communicate with one another through scent marking. How does reproduction occur with gray foxes? Gray foxes form monogamous pairs that breed once a year, the breeding season varying by location but usually sometime between January and May. After a gestation period of about 53 days, 1 to 7 (average = 3.80) young are born in a pile of brush or rocks, a crevice, a hollow tree, or a burrow that is either self-excavated or taken over from another animal. Both male and female gray foxes provide protection for their offspring. Female gray foxes nurse their young until they are able to hunt for themselves at about four months old. After four months, the young have their permanent dentition and can forage on their own. The family group remains together until autumn when the young are about six months old and sexually mature. What is the lifespan of gray foxes? Gray foxes may live 6 to 10 years in the wild. What role do gray foxes play in their ecosystem? Gray foxes are important predators to their ecosystems because they help to control the numbers of prey species like rodents and insects. What is the conservation status of gray foxes? This species is currently not of any special conservation concern. Jansa, S. 1999. “Urocyon cinereoargenteus” (On-line), Animal Diversity Web. Accessed December 08, 2006 at http://animaldiversity.ummz.umich.edu/site/accounts/information/Urocyon_cinereoargenteus.html. Nowak, R.M. 1999. Walker’s Mammals of the World. Baltimore and London, Johns Hopkins University Press.